Jason Kenney, United Conservative Party leadership candidate. Alberta conservatives don’t get it. They’re so eager to fight with the British Columbia NDP government – and pipeline opponents hoping for a Hail Mary pass from Premier John Horgan – that they happily undermine Alberta’s case for the project. Or, if one takes a more cynical view, they’re willing to ally themselves with Greenpeace if it means scoring political points against the Alberta NDP government. 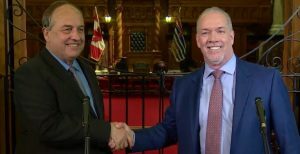 Green Party leader Andrew Weaver, left, shakes hand of John Horgan, BC NDP leader, at Monday press conference to announce Green support for NDP minority government. Photo: CBC. Yesterday’s column criticized United Conservative Party leadership hopeful Jason Kenney for threatening that if he becomes premier and if the BC government succeeds in blocking – or even delaying – construction of the 525,000 b/d Trans Mountain Expansion project that will carry Alberta crude oil to the West Coast for shipment by tanker to Asian markets, he will retaliate against BC trade with Alberta. Conservatives responded to the column by arguing that since Alberta Premier Rachel Notley wasn’t standing up for the province’s biggest industry, someone had to. Consider for a moment the forces arrayed on the side of Kinder Morgan, and by extension, Alberta’s interests. The Canadian Constitution, which assigns exclusive authority and jurisdiction over inter-provincial “works” to the federal government. The Supreme Court of Canada, which over the past 60 years has consistently re-affirmed Ottawa’s jurisdiction over inter-provincial pipelines and will most likely do so again if a challenge that authority makes to our country’s highest court. The National Energy Board, which acts with the authority of the Canadian government in matters such as these and will, no doubt, act swiftly if the BC government tries to “impair” the authority of the feds by delaying permits or other obstructionist tactics. Prime Minister Justin Trudeau, centre, announces federal cabinet approval of Trans Mountain Expansion on Nov. 19, 2016. Prime Minister Justin Trudeau, who since he announced his cabinet’s approval of Trans Mountain Expansion on Nov. 19 2016 has stood firm against demands from pipeline opponents that he reverse his decision. Alberta conservatives dismiss Trudeau as a feckless, selfie-obsessed dilettante, but for someone with supposedly has no character the Prime Minister is doing a remarkably good job of standing on principle and not reversing course. Notley, who has dragged her feet getting to Vancouver to support the pipeline case, but is finally making the trek in Sept. And the Alberta NDP premier is quietly talking to her BC NDP counterpart, making her province’s case for another market and for the industry, which is taking significant action against greenhouse gas emissions, partly thanks to Notley’s Climate Leadership Plan. Finally, fear on Horgan’s part that if Trans Mountain Expansion is frustrated, Kinder Morgan will successfully sue the BC government for hundreds of millions, perhaps even billions of dollars. Attorney General David Eby’s backpedalling last week during a Kamloops radio interview shows just how worried Horgan is that the inflammatory rhetoric used by him and the Green Party supporter of the NDP minority government, Andrew Weaver, before and during the recent election campaign would not play well in a court of law. Now, what do Horgan and pipeline eco-warriors have going for their cause? 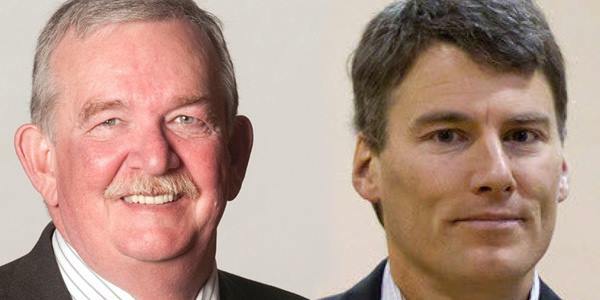 Derek Corrigan, Burnaby mayor left), Gregor Robertson, Vancouver mayor. First Nations legal challenges currently before the courts may nip at Kinder Morgan’s heels, but Trudeau has declared the pipeline to be in the national interest and that determination is likely to over-ride indigenous objections. All that leaves is the determination of British Columbia pipeline opponents to recruit so many residents of Metro Vancouver and the rest of the province to their side that Trudeau will bow in the face of that political pressure. The federal government and the Prime Minister “will see such hell-raising from British Columbia that they will feel it shake the foundation of Parliament,” Green Party of Canada Leader Elizabeth May told reporters after a Nov. 19 protest march through Vancouver that attracted over 4,000 people. The smart play, then, is to appeal to political moderates and conservatives in British Columbia and create a coalition of voters to offset the pressure applied by May, Vancouver Mayor Gregor Robertson, Burnaby Mayor Derrick Corrigan, and an armada of motivated and well-funded eco-warriors that includes plenty of extremists who will likely resort to sabotage and probably even violence to achieve their goals. A year ago, a bevy of public opinion polls found considerable BC support for Kinder Morgan. An Ipsos Reid poll found that 41 per cent of BC residents think the NEB made the right decision approving Trans Mountain Expansion (with conditions), while only 34 per cent think it made the wrong one. A Forum Research poll found 52 per cent in favour and 41 per cent opposed. For sake of argument, let’s say the province is split on the issue. The worst thing Alberta can do is pick public fights with British Columbia and potentially drive supporters into the anti-pipeline camp or leave them sitting on their hands because they’re offended by bozo eruptions like Kenney’s retaliation threats. Bozo eruptions serve no practical purpose other than to assuage the persecution complex of Alberta conservatives, who have fervently believed since Justin Trudeau’s father Pierre imposed the National Energy Program in 1980 and drove the oil and gas industry into the ground for most of the 80s, that the Rest of Canada has it in for the Wildrose province. 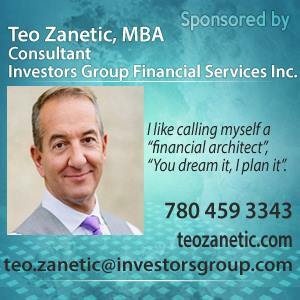 Alberta, as demonstrated above, has all the advantages on its side this time. It isn’t the victim. But if Alberta conservative leaders, like Kenney and his UCP leadership opponents Brian Jean and Derek Fildebrandt, continue to pander for support within their own constituency by threatening British Columbia over Trans Mountain Expansion, that is the one of the few things that could drive BC moderates into the anti-pipeline camp. And then the political pressure might be too great for Trudeau and the federal government. Kenney could hand Horgan the political miracle he’s looking for. Kinder Morgan fires up the bulldozers in September and the protests will start soon after. Kenney and his fellow conservatives should stop the bozo eruptions now, before they inflict political damage that can’t be undone. British Columbia is listening. PreviousJason Kenney threatens trade war with BC over Trans Mountain…whose interests is he serving? Did Harold Hamm threaten to drive Canadian, Mexican oil from the American market? Kinder Morgan’s pipeline is stupid idea to start with. because there is no equipment to clean-up a dirty, tar sands spill. This stupid idea is an insult to the intelligence of the British Columbia people. The dilbit is riddled with cancer-causing benzene. economy. (We all are.) They also think stopping pipelines is good for the environment but fail to recognize that the oil will move regardless and that alternatives – trains and trucks – are more dangerous and damaging. Pipelines have become an easy target for lazy thinkers who think that opposing them is a sufficient contribution to Eco-responsibility.